Yawn ! – One thing that I hate more than rain is waking up early ! 5am and I’m up and about getting ready to make the journey to London to run in this year’s London Marathon. After I munch down my oats I’m ready and on my way. 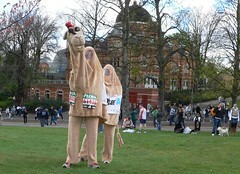 I get there without too much hassle – last year the DLR trains weren’t working properly so this poor camel had to run to the start – and then run a marathon ! 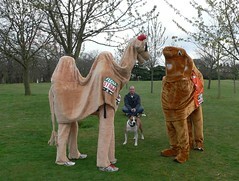 Just before the start I’m greeted by another marathon running camel (I thought I was the only one !). 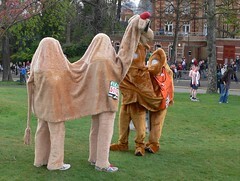 His name turns out to be Calvin the Camel and it is his first marathon – I give him some tips and things to look out for and wish him good luck – I hope you made it to the finish line ! 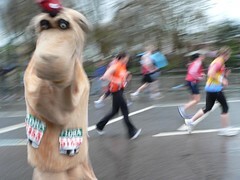 Anyway, this camel digresses… it was all very camel friendly, people cheering and having a great time until I felt the ‘pit-pat’ of rain on my humps and soon the course was awash and I had to run – no, make that squelch – for the next couple of miles until the rain stopped but there were still some very big puddles and when a camel is moving at speed the puddles are hard to dodge ! 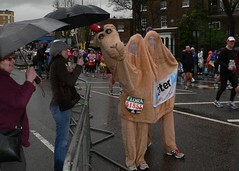 Mile after mile passes and I get wetter and wetter and there is no sign of my fellow marathon running bactrian – I hope they are ok !. Just to make things slightly worse it starts to rain again but by now I am a thoroughly soggy camel, – still, only a few more miles to go and then we’ll be there ! The crowds along the Mall are again marvellous and I make a final surge for the finish line which we cross 5 hours and 16 minutes after starting the race in Greenwich Park. Not my best time I must admit (I’ll try to better it next year) but there haven’t been many marathons that I’ve run that have been this wet ! I’ll be there again next year so I hope you will be too !